Posted: February 14, 2018 in Behavior that shows holiness and consecration to Jesus, Warrior Bride of Jesus: Instructions, Watch always. "Keep your lamp full of oil and wick trimmed." When you come to me you must come as a child, humbly. For a little child is not proud and he knows that he is weak, compared to the strength of his father. I love when My children come to Me in meekness and crawl up on My lap, longing to be close to Me. I put My arms around them and they around Me, now it is spiritually by faith but soon it will be with unveiled eyes. I show them My love and I enjoy being with them and they with Me. It is not a “chore” or a “burden” for My children just to spend time with Me, they enjoy My presence. In this day I see many children who come before Me brazen and brash and demanding, with no sense of awe or fear, irreverently, like I am their equal. They should be coming to Me on their knees and on their faces in repentance but because they are proud and I will humble them. Because I AM a good Father and I discipline My children because I love them. Is this not better than allowing them to go straight into hell? They think of themselves more highly than they ought, because of their wealth and positions of power. Because of this I will try them and strip them of everything they have. I will bring many fiery trials and tests upon My children to see what is in their hearts. My children, do not despise Me for this for it is necessary. You to need get all of the world’s sinfulness and pride out of yourself. For I will judge all those who have iniquity in their hearts. Sin cannot remain in My presence. I will consume everything with sin at My second coming. Little children love all people easily and this is how I would have you be. They have not yet learned bias, prejudice or favoritism and power and wealth means nothing to them, just like it means nothing to Me. I own the cattle on a thousand hills, pave streets with gold, I Lack NOTHING! I AM your source for everything that you need and I delight in giving it to you, if it is not consumed by you in worldly lust. A good child also loves like his good father. For he loves his father and wants grow up to be more like his father every day. 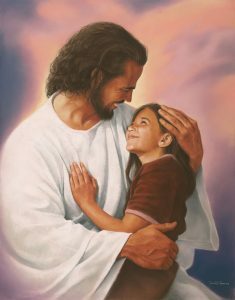 He learns of the father’s ways as he spends time with him and the father teaches him to love others as well. My children love because their DNA has been changed by My Spirit and they do the things that I do, just as I did the things I saw My Father doing while I was on the earth. Little children trust, have faith and believe everything their good father says for they know that he would never lie to them. These children know that their father only does things that will benefit them even if it is not easy and may involve pain for a little while. I say this to you “For I know the thoughts that I think toward you, says the Lord, thoughts of peace and not of evil, to give you a future and a hope.” Jer 29:11 and ” We know that all things work together for good to those who love God (with all of their hearts), to those who are the called according to His purpose.”Rom 8:28 That purpose you are called to is to be conformed into My image. If you know Me you know the Father, for We are one and if you know us, you are one with us in the Spirit and We live in you and through you and We do our good works to build Our kingdom and nothing is impossible.